This is an upgrade for the Roland MKS-30 rack mount synth module. This upgrade will add full midi support, Arp and Sequencer and 1536 tones storage. The upgrade also adds a LCD display into the redundant cartridge slot. 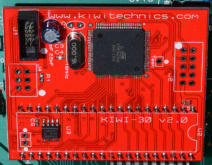 Prices Kiwi-30 Upgrade is US$195 + Freight Freight is US$42 via NZ Post Economy Courier (Australia US$22) (tracked*) * Tracking is available to USA, Canada, UK, Australia & Most of Europe and Asia - for other destinations please contact. Purchase requires a verified Paypal email. Please use the order page to have a Paypal invoice sent to you.